Theresa May was forced to publish the previously secret legal advice given to her Cabinet on the Brexit deal — and it gives a potentially explosive verdict on the divorce terms she struck with the European Union. 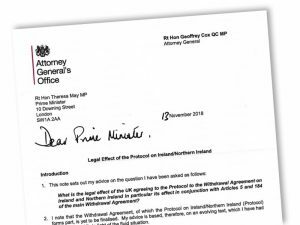 Cox’s letter lays bare in the starkest terms how the backstop will split Northern Ireland away from the rest of the U.K. This is a dangerous finding for May because keeping the four nations that make up the U.K. together is a totemic issue for many Tories. And the unity of the U.K. is of fundamental importance to the small party of 10 MPs propping up May’s minority Tory government: Northern Ireland’s Democratic Unionist Party. If the DUP pull the plug, May’s government ultimately collapses. The DUP reacted with immediate horror to the blunt assessment of new barriers between the mainland and Northern Ireland. “This is totally unacceptable and economically mad in that it will be erecting internal economic and trade barriers within the United Kingdom,” DUP deputy leader Nigel Dodds said. Prime Minister Theresa May’s government lost three votes in the House of Commons on Tuesday, even before the main debate got underway. May is seeking approval from the house for the exit deal from the EU which her negotiators signed off last week. That vote will be taken next Tuesday. But this Tuesday began with a setback for her as a European Court of Justice advocate general gave formal advice that revoking the “Article 50” divorce notice was an option for the House without the other EU 27 member states having a say. The UK does not need approval of other EU countries to withdraw from Brexit, the advocate ruled. In the margins, there are the headlines on the six o’clock news telling you Theresa May has a “deal” agreed to by Brussels — and she is off to sell it to the nation. A “deal” implies you got more than what you bargained hard or hoped for, or that someone threw in an extra bottle of Fairy Liquid for free. Theresa May is misusing the term “deal”. What she is calling a “deal” is a literal deceit to the nation. This “deal” is anything but good for Great Britain. This “deal” is, in reality, a sell-out. Farage has described it as “The worst deal in history”; even more wretched, as he points out, is that — as one cannot leave it without the EU’s permission — it offers Britain even less sovereignty than it has now. Theresa May and her Remainers are counting on this deceit as well as the utter fatigue of Conservative constituents — an understandable impatience of voters for Brexit to be “over” with it — to push her sordid “deal” over the line. While I would not agree that Theresa May has been pushing “the worst deal in history,” there are obviously many issues that many have about it. I have been warning for some time that Northern Ireland would be a major issue with Brexit, and it clearly is. The border between the Republic of Ireland and the UK’s Northern Ireland has been open for some time, and the EU and UK would prefer it to remain open–but many in the UK are upset that the EU essentially thinks that Northern Ireland will have to function a lot like it is still in the EU for that border to be open. These territorial losses will include Northern Ireland and Gibraltar, as well as England, Wales, and Scotland. Yes, one day, the United Kingdom of Great Britain and Northern Ireland will be no more. In one of the biggest shifts in perceptions since the shock 2016 vote to exit the EU, JPMorgan raised the probability of Britain ultimately staying in to 40 per cent from 20 per cent. Ever since the referendum, investors have speculated that the UK’s biggest economic and political shift since the second World War could ultimately be thwarted, though it was unclear what the mechanism might be. “The UK now appears to have the option of revoking unilaterally and taking a period of time of its own choosing to decide what happens next,” JPMorgan economist Malcolm Barr wrote in a note to clients. Even if there is a ‘hard’ (no deal with the EU) or ‘soft’ (May’s proposal) Brexit. or even if there is NO Brexit, I expect that the Republic of Ireland (or at least an Irish leader) will have control over Northern Ireland and probably other lands as well with the next decade or so. It is the firm will of the Irish Nation, in harmony and friendship, to unite all the people who share the territory of the island of Ireland, in all the diversity of their identities and traditions, recognising that a united Ireland shall be brought about only by peaceful means with the consent of a majority of the people, democratically expressed, in both jurisdictions in the island. Until then, the laws enacted by the Parliament established by this Constitution shall have the like area and extent of application as the laws enacted by the Parliament that existed immediately before the coming into operation of this Constitution. While the democratic way is one way, if that does not work, military pressure will accomplish this (cf. Daniel 8:24-25, 11:39). St. Senanus (d. 560): They (English) themselves will betray each other: in consequence their sovereignty will be broken…One monarch will rule in Ireland over the English (Culleton R. Gerald. The Reign of Antichrist, Reprint TAN Books, Rockford, IL, 1974, p. 128). Priest G. Rossi (19th century): Ah! wretched Protestantism shall have to answer for the loss of faith… English schism and heresy have squandered their treasures and abused their great temporal power, not only in persecuting-the faith in Great Britain and Ireland, but also in banishing the true religion of Jesus Christ from their vast American possessions…Their long-deserved punishment, however, is approaching from the North! (Rossi, Gaudentius. The Christian Trumpet: Or, Previsions and Predictions about Impending General Calamities, the Universal Triumph of the Church, the Coming of the Anti-Christ, the Last Judgment, and the End of the World; Divided Into Three Parts, 4th edition. Patrick Donahoe, 1875. Original from Oxford University. Digitized Sep 1, 2006, pp. 16, 255). Although I wrote what I did based upon biblical prophecies, the desires of Spain and Ireland, as well as the writings of Catholic prophets, are consistent with the view that the UK will lose Northern Ireland and Gibraltar. With what has been going on in the UK, the EU, and the USA since the Brexit vote, more in the UK are concluding that the EU wants to be an empire. The EU has taken several stances that the UK does not like, including stances that the EU used to pretend it did not really have. Glimpses of the true colors of the European project (e.g. Daniel 2:41-43; Isaiah 10:5-8) have re-assured some in the UK that leaving the EU is in its best interest. Consider that the Bible itself teaches that Europe will reorganize and unite (Revelation 17:12-13; see also Must the Ten Kings of Revelation 17:12 Rule over Ten Currently Existing Nations? ), as well as become the dominant world trading power for a time (Revelation 17 & 18). The Bible also teaches of a time of Jacob’s trouble (Jeremiah 30:7)–and this will include the UK (as well as the USA, Canada, Australia, and New Zealand). The Bible is accurate and its prophecies can be counted on. Most people do NOT realize what will happen in Europe. Europe is not going to ‘get over’ the Brexit and will one day take actions that most of those in the UK (as well as USA and Canada) will not consider possible (cf. Daniel 8:24-25, 11:39; see also USA in Prophecy: The Strongest Fortresses). Will the UK Lose Gibraltar and the Falkland Islands? Spain wants Gibraltar and Argentina wants the Falklands (also known as the Malvinas). Does the Bible give clues as to what will happen with these ‘sea gates’? A version of the article in the Spanish language would be ¿Perderá el Reino Unido a Gibraltar y las Islas Falkland (Malvinas)? This entry was posted on Wednesday, December 5th, 2018 at 7:00 am	and is filed under Prophecy. Brexit: Is Theresa May playing ‘Deal or No Deal’?